With only 10 weeks left to go (yes, I said only. ten. weeks) until my third little girl arrives in this great big world, I’ve got all things newborn on my mind. When I was offered the opportunity to host a giveaway for HappyGreenBaby.com I jumped at the idea. Why? Because frankly, they rock. At HappyGreenBaby.com we believe that green babies are happy babies. That’s why everything you find on our website is a smart, healthy, eco-friendly choice for your family. From stainless steel, BPA-free baby bottles, organic cotton crib sheets to chemical free skin care products . Your baby will enjoy playing with our recycled plastic toys and will love wearing our comfy, eco-friendly, soy and bamboo fiber, organic clothes. You’ll find everything you need for a happy green and enviornmentally friendly baby (& family) right here! What can you get, exactly? They’ve got anything and everything related to healthy, happy ecofriendly babies. And toddlers. And kids. And moms. The winner (US residents only for this one, please!) will receive a $50 gift card towards anything in the HappyGreenBaby online store. And the only thing you need to do to enter to win is to visit their store and leave us a comment with a link to an item that you’d buy with the card. Simple, right? One comment with a link. There’s also a few non-mandatory and easy options to win extra points simply by following HappyGreenBaby, Homegrown & Healthy, and the rest of the cohosts. Please note, this giveaway is only open to US residents! (Don’t worry, we’ll have plenty of giveaways in the future for those of you outside of the US). Giveaway ends December 13, 2014 at the stroke of midnight, EST. Thank you to Mama Pure for their great review of HappyGreenBaby.com, and for hosting a giveaway! If you haven't had had a chance to read the Mama Pure Blog, that a look HERE! The review is posted below. Don't forget to enter the giveaway - it ends tomorrow! ENTER HERE! I'm always searching for green and eco-friendly baby items. Which is why I'm so happy to have found Happy Green Baby! Here are a few items they carry that are on my list for baby pure who is due in a little less than 4 weeks. I love that Happy Green Baby carries organic cotton toys. Not only is organic cotton more eco-friendly, but I am happy to know that only the purest of fabrics will be on my baby's skin and going in her mouth. I absolutely love anything from aden + anais! Have you felt their bamboo fabric? It is one of the softest things I have ever felt on my skin so I know it will be perfect for baby. Happy Green Baby also carries the organic cotton sleeping bag too. These diaper bags from 2 Red Hens are so adorable! They come in several cute and fashionable prints that any Mama would be happy to carry. My favorite that I have been lusting over for a few weeks is "Peacock Mum". I think the prints are pretty Dad friendly too. They have lots of pockets for storage and easy organization and the straps are large enough so it can fit easily on your shoulder for carrying. It is BPA, PVC, and Phthalate free but still water resistant AND machine washable! Here is your chance to win a $25 e-Gift Card to Happy Green Baby! There is only one entry per person. Please submit using the rafflecopter below to officially enter. You must comment on this post with another item you are interested in from Happy Green Baby's website that was not featured in this post. Please read Terms and Conditions below. Open to US/CAN Age 18+. 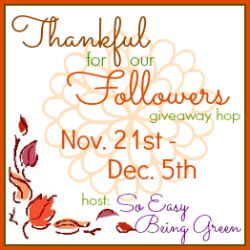 **Take a peek HERE at all the giveaways taking place right now at HappyGreenBaby!